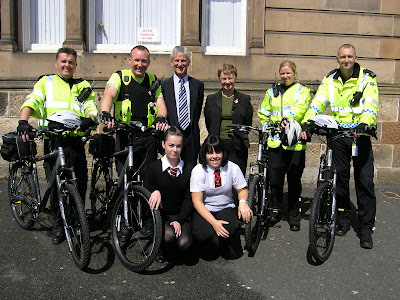 SOUTH AYRSHIRE Community Safety Partnership has funded the purchase of four bicycles, one for each of the Campus Police Officers who work in Ayr Academy, Belmont Academy, Kyle Academy and Marr College. Since February 2008 the Police Officers have been based in the four secondary schools and been actively working with pupils, teachers, the feeder primary schools and the local communities at their respective schools. Councillor Margaret Toner, Depute Leader of the Council and Chair of the South Ayrshire Community Safety Partnership said: “The Campus Police Officers have proved to be a great asset in the schools and the local communities. We decided to fund the purchase of a bicycle for each of them so that they can travel in their respective areas in a way that makes them highly visible. They will be using pedal power to drive forward the valuable work that they are carrying out. * Improving relationships between young people and the Police. * Engaging with young people and developing their role in the community. * Problem solving in the school and community. * Helping local people to have more say in community safety issues in the school and community. * Participating in the Pupil’s Council/Forum. * Developing and delivering specific projects such as Internet safety, youth crime prevention and personal safety. * Providing a visible presence in and around the school community. * Linking young people to existing constructive activities. * Supporting and developing activities to address challenging behaviour. * Linking young people to programmes and support already in place. * Liaising with departments and organisations already involved in delivering programmes for young people. * Promoting a restorative justice approach to encourage young people to take responsibility for their school and community. * Reducing the number of offences in and around schools. * Increasing the number of pupils who feel safe in school.